This tutorial is aimed for users who do not have much experience in using the Sandbox. The Sandbox is a straightforward, pre-configured, learning environment that contains the latest developments from Apache Hadoop, specifically the Hortonworks Data Platform (HDP). The Sandbox comes packaged in a virtual environment that can run in the cloud or on your personal machine. The Sandbox allows you to learn and explore HDP on your own. Refer to Login Credentials for list of users and passwords. You can also login using root, using password hadoop, which may require you to change the password – remember it! If you login using credentials other than root, you will be required to use sudo before the command. For example: sudo ambari-server status. Launch Dashboard opens two browser windows – Ambari interface and beginner tutorial. You should login to Ambari using the username and password based on the tutorial requirements. Most of the tutorials use raj_ops or maria_dev. Refer to Login Credentials for list of users and passwords. Advanced HDP Quick Links provide quick access to Ambari Services such as Zeppelin, Atlas, Ranger, Shell-in-a-box and others. 2. Background Operations,Alerts, Admin and User Views, icon (represented by 3×3 matrix ) to become familiar with the Ambari resources available to you. 2. maria_dev – Responsible for preparing and getting insight from data. She loves to explore different HDP components like Hive, Pig, HBase. 3. raj_ops – Responsible for infrastructure build, research and development activities like design, install, configure and administration. He serves as a technical expert in the area of system administration for complex operating systems. 4. holger_gov – Primarily for the management of data elements, both the content and metadata. He has a specialist role that incorporates processes, policies, guidelines and responsibilities for administering organizations’ entire data in compliance with policy and/or regulatory obligations. 5. amy_ds – A data scientist who uses Hive, Spark and Zeppelin to do exploratory data analysis, data cleanup and transformation as preparation for analysis. Refer to the Sandbox Guide for ports available for custom use. In this example we will use the fictional port 1234, note that this port is not available for custom use. Now restart the virtual machine and enjoy your new port. At times you may encounter a job, query or request that just seems to run forever and does not complete. It may be because it’s in the ACCEPTED state. A good place to begin looking is in the ResourceManager. If you know a job has completed, but the Resource Manager still thinks it’s running – kill it! Once the Sandbox VM is installed, it attaches to a virtual network. There are 8 different network modes, but the default network your sandbox will attach to is NAT. We will cover relevant networks for our tutorial use cases: NAT and Bridged Adapter. By default, the VM attaches to Network Address Translation (NAT) network mode. The guest’s IP address by default translates over to the host’s IP address. NAT allows for the guest system to connect to external devices on external networks, but external devices cannot access the guest system. Alternatively, VirtualBox can make selected services on the guest reachable to the outside world by port forwarding. VirtualBox listens to certain ports on the host, then re-sends packets that arrive at those ports to the guest on the same port or different port. 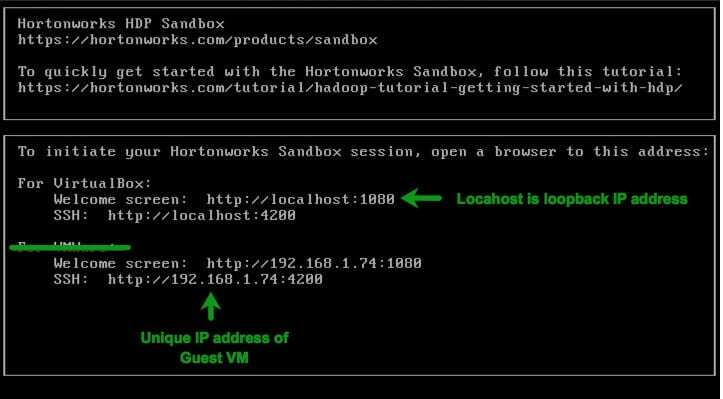 VBoxManage modifyvm "Hortonworks Sandbox HDP 3.0.1" --natpf1 "Sandbox Splash Page,tcp,127.0.0.1,1080,,1080"
VBoxManage modifyvm "Hortonworks Sandbox HDP 3.0.1" --natpf1 "Sandbox Host SSH,tcp,127.0.0.1,2122,,22"
When would you need this mode? It is needed for Connected Data Architecture(CDA). To configure this mode, first power down your guest vm, click settings, switch to the network tab and change the attach to network to be Bridged Adapter. Well written, but dependencies should be explained. I could not get past setting up the container as the docker IP 127.0.0.1 goes nowhere and there are no instructions for setting the NAT with docker. It probably isn't that hard, but still any tutorial is assumedly made for novices and should be 100% thorough. I could not get past setting up the container as the docker IP 127.0.0.1 goes nowhere and there are no instructions for setting the NAT with docker. It probably isn’t that hard, but still any tutorial is assumedly made for novices and should be 100% thorough. As of 18.09.2018 tutorial is up to date with the actual software. This is very important. It is frustrating for a greenhorn when a tutorial, which is different from the actual software. I would add one word of warning to this document. You have to make a correct shutdown. If you do a VM power off, you are very likely to corrupt the whole thing.